Watching movies always plays an important role in our usual entertainment. Blu-ray HD disc and DVDs are best choices beyond doubt. But there are also lots of reasons to transfer DVD movies to Mac. You might want to watch on your iPhone,iPad or tablets which do not have DVD drives; you wanna to save DVD collections to Mac as a collection or set free from the bulging room of DVD collection. Whatever the reason, copying and saving DVD to Mac become a burning question. Here is how to do it on Mac or PC. First of all, you need a DVD ripper for macOS. MacX DVD Ripper Pro is exactly one of the one you need, giving you an unprecedented experience of ripping or copying DVD to MP4 MOV H264, etc. movie formats. Besides, DVD especially commercial DVD usually contains protections to prevent being pirated for profits, while in terms of personal use, transferring DVD collections to Mac hard drive is brings much convenience to us and makes DVD free from being scratched or damaged. This No.1 fast DVD ripper for Mac precisely works as an expert in ripping protected DVD, no matter the region code, CSS, RCE, Sony ArccOS, UOPs, or the latest Disney X-project protection encryption. By very simple operation, users can save DVD to Mac fast with original quality reserved. It also allows users to rip DVD to MP4, AVI, FLV VOB, MKV, AVCHD, MPEG-2, ISO image, MP3, etc. as well as iPhone, iPad, Android mobile devices. 1Import DVD Files. Free download the DVD ripper for Mac or Window version and launch it on your computer. Insert the DVD disc and then load to the program by clicking "+" button. 2Choose the output format. You are free to choose ISO image, DVD folder for 1:1 copying DVD to Mac/PC. Or if you are willing to import DVD to iMovie, iTunes, iPhone iPad devices, MP4 is strong recommended. 3Click "Browse" button to specify the output folder to save your transferred DVD on Mac. 4Hit "RUN" button to start to convert DVD on Mac. One more thing: A newly released super star product from MacXDVD called MacX MediaTrans is helpful for you when you need to transfer converted DVD movies from Mac to mobile device iPhone iPad. It's a professional yet all-round iPhone manager to transfer music from iPhone to Mac and copy photos, videos, ringtone, iBooks, iTunes U, Podcast between iPhone iPad and Mac computer in seconds, as well. Note: The software developer only advocates ripping and transferring DVDs for personal legal use and suggests referring to the DVD copyright laws in your countries before doing so. Obviously, MacX DVD Ripper Pro manages the task of transferring encrypted DVD to Mac with ease, let alone the unprotected DVD. As a matter of fact, to mention of DVD ripper, I bet many of you think of Handbrake (for El Capitan) the first time. It does do well in ripping and copying unprotected DVDs on Mac OS. Plus, Handbrake is totally free, thus even if it's not as strong as other paid DVD rippers, it's also heavily favored. Step 1: Load Source DVD or Video. Click "Source" to add unprotected DVD you'd like to rip. Step 2: Choose Output Format or Preset. 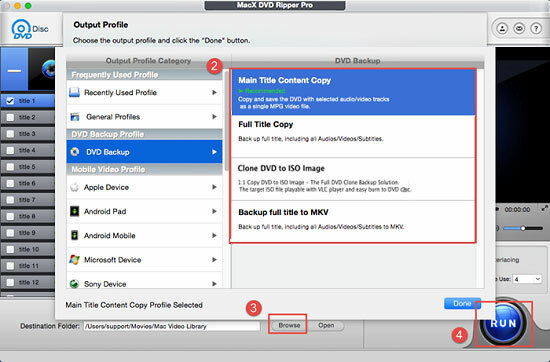 You are able to rip DVD to MP4, MKV, AVI or OGM on Mac. Plus, armed with certain presets, you are free to select iPhone, iPod, Apple TV as your preset. Step 3: Select the Destination Folder. Press the "Browse" button to choose the path where you want to save DVD to Mac. Step 4: Adjust Video and Audio Settings. 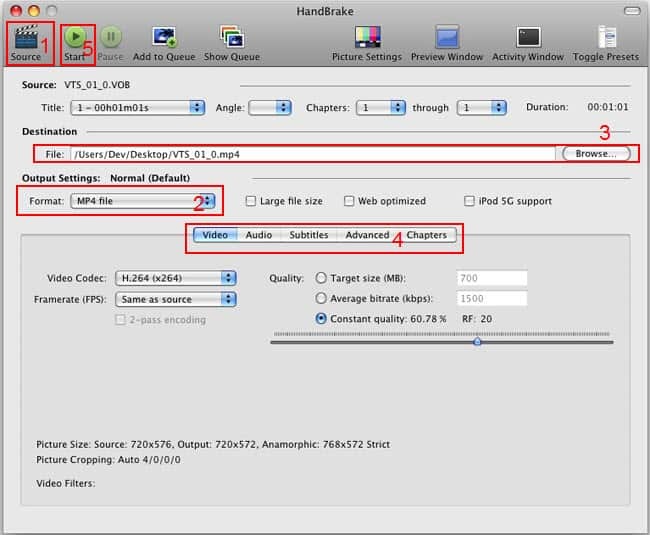 With the latest Handbrake, you can better tweak the output parameters of video filters, video, audio, subtitles, chapters, picture, etc. to let your output videos more applicable and personalized. Step 5: Start to Rip DVD. Once the above steps done, you can go ahead to rip DVD on your Mac computer by simply hitting the "Start" button on the left top of Handbrake for Mac version. MacX DVD Ripper Pro is the DVD copy and ripping software which can freely remove any DVD protection and transfer DVD to MacBook/iMac in various video formats (MP4, MOV, MKV, AVI, FLV, MPEG-2, etc) and portable devices with original quality.